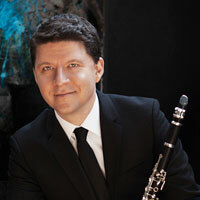 Never one to shy away from challenging audiences with a mixed musical presentation, Lubbock Symphony Orchestra music director Tomasz Golka returns to the podium this weekend and juggles an established soloist (clarinetist Alexander Fiterstein) with little heard (here anyway) music from Golka's homeland (Witold Lutoslawski's fourth symphony). The premiere of a never-before-heard fanfare by LSO composer-in-residence Jude Vaclavik opened Friday's concert, which will be repeated at 7:30 p.m. today at the Lubbock Memorial Civic Center Theatre. And then, as though hedging his bets, Golka saved Tchaikovsky's masterful "Romeo and Juliet Fantasy Overture" for last, confident that his musicians would communicate all the beauty and heart within this familiar composition. It proved to be a clever combination, although the work by Fiterstein together with the orchestra on Mozart's Clarinet Concerto in A Major may have been most beloved by Friday's audience, and for good reason. In the hands of this musician, the clarinet was rarely treated in formal fashion; rather, Fiterstein ably seduced the warmest possible sounds from an instrument which could have been mistaken for friend or even dance partner. Indeed, this player never stood stiffly in place, his fingers attracting satisfying notes in a fashion that had grown familiar to him long ago. One doubts most listeners embraced the Lutoslawski piece with as much passion, but I loved it. That said, Golka's lengthy introduction drew thematic comparisons to composer Brad Fiedel's "Terminator 2: Judgment Day" (foreshadowing rather than music), but parts seemed at least somewhat reminiscent of past choices made by Jerry Goldsmith for "Planet of the Apes" - although Lutoslawski commands attention that explodes into far more interesting musical choices. Frankly, I wished the LSO could have played it again after a break. Vaclavik's fanfare proves to be a brief military salute. It is stark, refusing to be ignored - and ends with listeners wanting more. The entire orchestra contributed beautifully to Tchaikovsky's "Romeo and Juliet" overture, once again proving that Lubbock's ensemble, ably conducted by Golka, can earn ovations on its own, as well. Friday found Fiterstein rewarded with a standing ovation before intermission, and the orchestra earning one on its own at concert's end. Both were well earned, and the audience was the ultimate winner each time.